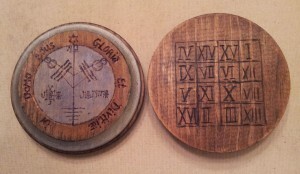 The above image is the face and reverse of a paten created for the purposes of drawing wealth and riches to the bearer. Because it’s hard to come by a piece of silver large enough to burn candles on, I made these from pine, a tree which the Renaissance astrologer William Lilly assigned to the planet Jupiter, with silver leaf around the edges. The face is woodburned with the 4th pentacle of Jupiter, with the names of the angels in Agrippa’s malachim script and the versicle from the Psalm 112:3 in Latin. Translated it means: “Wealth and riches are in his house.” The square of Jupiter is burned into the reverse. These were made on the day and hour of Jupiter, with Jupiter in Cancer as prescribed in the Key of Solomon (the planet moves into Leo in July 2014). Oh my, what a spectacular article. Thanks!